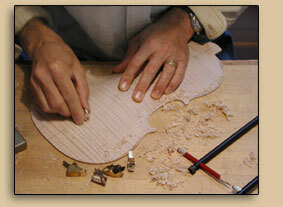 Violin making is an old craft rich in tradition. I learned the craft in the old world way, from those who came before me â€“ first as an apprentice, then as a journeyman, and then as a master journeyman â€“ and my learning continues after nearly two decades as a master violin maker. Most of my work method today is the same as that used to build bowed string instruments hundreds of years ago. Other than a band saw, a drill press, and an electric glue pot, the tools and work methods used in my shop are essentially identical to those used in Cremona in the 17th century. Three centuries have, however, provided for some growth in the craft. Computerized analysis and the latest research in acoustical science place my work squarely in the 21st century. The science of acoustics offers the violin maker a remarkable new lens with which to evaluate process and outcome. I use it to better see into my work, quantify the intangible, and to some degree predict outcome. With the assistance of modern science my results are better, and my understanding of those results is better. Nevertheless, the application of acoustics to my work doesn't supersede hundreds of years of tradition and forty years of experience in the craft; a great violin cannot be made by numbers alone. I firmly believe that fine bowed string instruments being built today rival in nearly every sense those built over three centuries ago, but one thing a modern maker cannot do is speed the passage of time. A modern violin must compete with the best of the old ones and then improve as time passes. To do this the violin must be well-built: healthy, not too thin, and free of the use of caustics to imitate the look of aged wood. Today we modern makers can almost perfectly copy older instruments â€“ varnish, archings, graduations, style, and wear â€“ but blind imitation doesn't lead to comparable acoustic results. We learn from the old masters and even emulate them, but posterity will reward those who do more than merely imitate. The very finest instruments will come from those committed to an aesthetic of their own. I take great satisfaction in crafting for the modern player an instrument that rivals the best built centuries ago, both visually and acoustically; an instrument that provides the broadest possible palette with which the artist may paint his or her own vision of sound; an instrument that is an investment in the future as well as the present.